Tyrannosaurus thinks that strength is the most important thing in the world, but as he ages he learns that love is more important than strength. Through his actions he shares this lesson with a group of baby Triceratops. Those little Triceratops grow up and in turn pass the message of love along to their children. 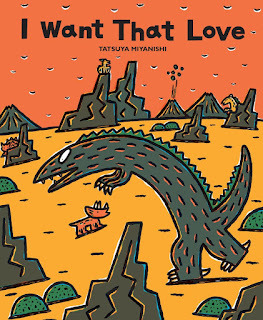 I Want That Love illustrates a powerful message on the importance of love, but that message is delivered by aggressive, carnivorous dinosaurs doing what aggressive, carnivorous dinosaurs do. While the message is strong, some may prefer to avoid the violence of the book. It is important to note, that while there is dinosaur on dinosaur violence in the book, the pictures are not gory. The book does an excellent job of showing the lengths that love can go in order to protect the ones you love. If you’re interested in reading I Want That Love, you can purchase a copy here on Amazon. Cyber Sale TPT Gift Card Giveaway!